Some of the most iconic plumbers known to humans! It’s a me! Mario! Mario and Luigi are arguably the most iconic duo in the history of plumbing. While our licensed plumbers are some of the best, they’re not equipped for rescuing certain princesses from certain Koopas…yet. Mario and Luigi were created by video game developer and design genius, Shigeru Miyamoto and the characters have since taken over the face of Nintendo and video games as a whole. You don’t see any electricians taking on that role. Catch these iconic plumbers at any Halloween Party and Comic Con for the next century. Sharon! Before Mr. Osbourne hopped aboard the Crazy Train, he used to fix pipes and provide plumbing services to those lucky enough to have issues! It may be hard for most to envision one of music’s most noteworthy artists as a former plumber, but trust us, there is nothing out of the ordinary here. The stars walk, and plunge, among us! Will we ever forget the 2008 conservative activist and icon, Joe the Plumber, who made headlines as John McCain and Barack Obama sought after the spot of president? 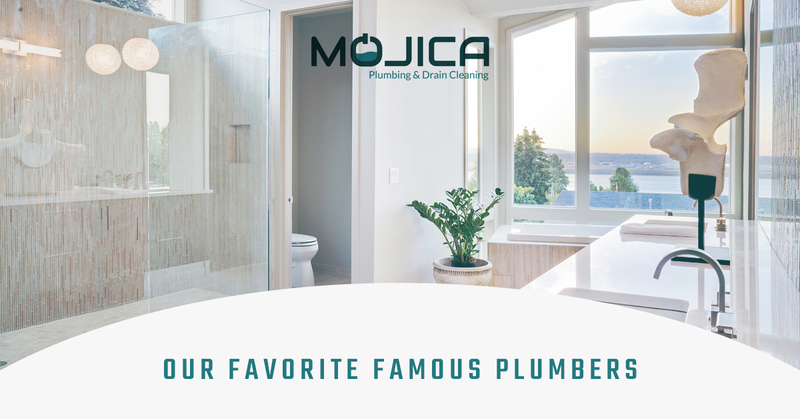 While we at Mojica Plumbing & Drain Cleaning prefer to remain unbiased towards politics (we’re plumbers, not campaign managers), we do appreciate those who remain true to plumbing. And Joe the Plumber, while questionable to many, brought plumbing to the forefront of issues! If you’re a longstanding fan of the Desperate Housewives, then you know exactly who we’re talking about. Casting aside all stereotypes that paint plumbers as chubby guys with pants that can’t seem to stay on, Mike Delfino stole both the show and perhaps the hearts of other characters. Mike Delfino was the controversial character, of many, on the show who was played by actor James Denton. The mid-2000s was a great time to be a plumber! Need some custom plumbing that’s both reliable and free of paranormal activity? Then perhaps give Grant Wilson, plumber and Ghost Hunter’s iconic paranormal extraordinaire, a call. Wilson, who also founded the Atlantic Paranormal Society (TAPS), was an iconic figure on SyFy’s reality television series, Ghost Hunters. If he wasn’t fixing your plumbing, then maybe he was ridding your home of spiritual entities. Either way, we at Mojica Plumbing & Drain Cleaning think that he’s pretty legendary. As you can see, our plumbing company has a pride for both quality plumbing and those who represent us quite well in the spotlight. While we can’t inspect your homes for ghosts and haven’t played in Black Sabbath, we’re still pretty phenomenal. For all things plumbing, give Mojica Plumbing & Drain Cleaning a call today!